Every so often, a puzzle comes along with a solution that is so patently, painfully, groaningly obvious, you can't help but overlook it. This is one of those puzzles. I am genuinely ashamed of how long it took me to solve this puzzle, the first time I encountered it. 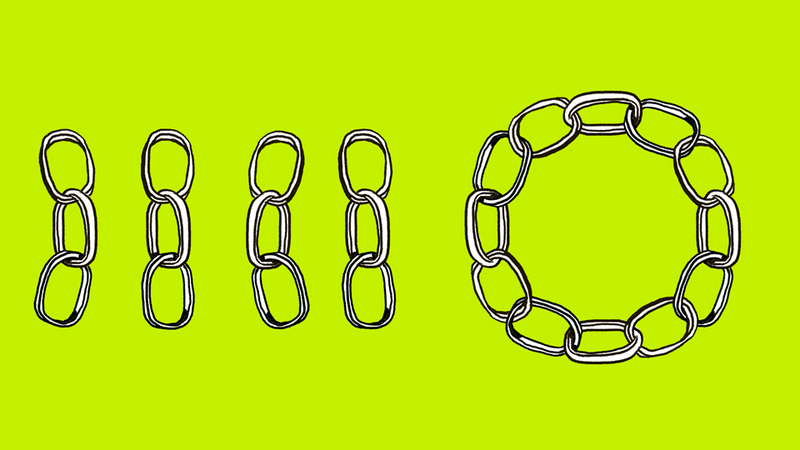 The task: Join the four three-link chains on the left to form the circular chain on the right. To join two chains, you must cut, and then re-weld, a link. What is the minimum number of links you must cut and re-weld to complete the circle? But – as I warned you in advance – impossible puzzle is impossible! The goal, then, was to explain why it is impossible. If a shape has an even number of edges then the line has to enter it as many times as it exits - so it either has to contain both ends of the line, or neither end. If, instead, the shape has an odd number of edges then the line has to enter it as many times as it exits, then enter or exit one more time. So it must contain either the beginning or the end of the line. There are three rectangles with five edges. Each of those three must contain either the beginning or end of the line. You can't put one of two ends in each of three rectangles, so it's impossible. This is as good a conceptual explanation to this puzzle's unsolvability as I've seen. Well done! If you're still confused, perhaps you'll find the graphical solution more instructive. This puzzle is very similar to the Seven Bridges of Königsberg, an historical conundrum that, like our line-crossing problem, is actually a mathematical challenge in disguise. More specifically, these puzzles deal with a field of maths known as topology, the study of geometric properties that are unaffected by the deformation of figures. Like our puzzle, the problem of the Seven Bridges of Königsberg ( which you can read about here) has no solution. We can explain why using something called an Eulerian path, a concept named after Swiss mathematician Leonhard Euler, who originally demonstrated the Königsberg problem's unsolvability in the 18th Century. One necessary (but not sufficient) rule for all Eulerian Trails is that there must be exactly zero or two nodes with odd "degree" (degree being defined as the number of paths connecting to that node). As you can see, four of the six nodes have odd degrees. Therefore, per Euler's proof, this graph has no Eulerian Trail. Likewise, there can be no path in the original diagram that crosses each line segment exactly once.